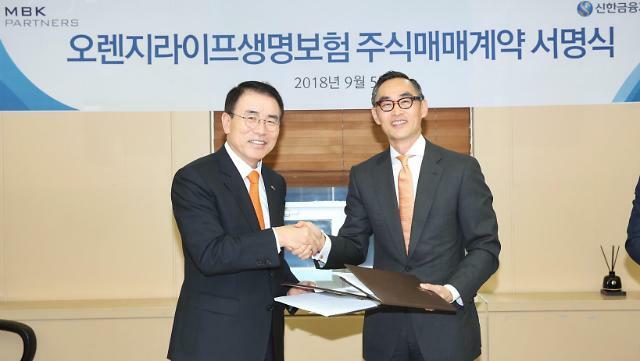 SEOUL -- Shinhan Financial, a major financial group in South Korea, signed a deal worth $2.05 billion to acquire an insurer, formerly known as ING Life Insurance Korea, as it seeks to consolidate its leadership in the competitive domestic financial market. The group said in a statement Wednesday that it signed a stock purchase agreement to buy a 59.15 percent stake in Orange Life. The deal was valued at 2.299 trillion won ($2.05 billion). Private equity firm MBK Partners bought the life insurer from the Amsterdam-based ING Group in 2013. Shinhan Financial said the acquisition would help the group bolster its presence in the life insurance market, which is expected to post steady growth due to a dramatic demographic change in South Korea, one of the world's fastest-aging societies. Orange Life, with assets estimated at 31.5 trillion won, posted a net profit of 340 billion won last year. If Shinhan completes the acquisition in early 2019, the group will become South Korea's biggest banking group with total assets rising to about 485 trillion won. "We are very pleased with the successful acquisition of Orange Life, which has a steady profit structure," Shinhan Financial Chairman Cho Yong-byoung said, adding the group would maximize its corporate value by seeking sustainable growth at home and abroad. Shinhan has diversified its business portfolio to become a global player. In January, the group forged a strategic partnership with China's Fosun group to seek an opportunity for global investment.